Signed and dated l.r. corner, yellow oil "R-BALSON -/42". Deborah Edwards, Australian art: in the Art Gallery of New South Wales , 'Moderns', pg. 103-104, Sydney, 2000, 104, 128 (colour illus. ), 300. Paul McGillick, Aspect: Art and Literature , 'The importance of Ralph Balson', pg. 4-17, Mona Vale, Winter 1981, 14 (illus. ), 15. 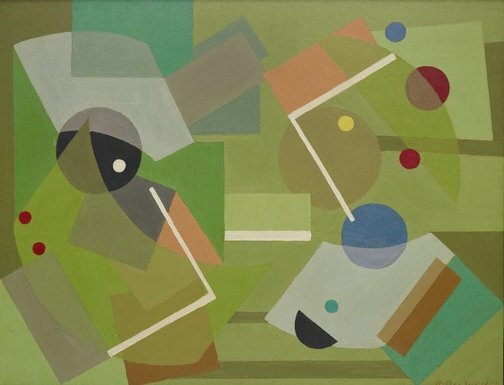 Lisa Slade, Sydney moderns: art for a new world , ''What the arty call the abstract': Ralph Balson's 1941 exhibition', pg. 290-295, Sydney, 2013, 293 (colour illus. ), 310, 320. Jill Sykes, Look , 'Small and temporary: but it's a big pointer to the future', pg. 28-29, Sydney, Sep 2011, front cover (colour illus., detail), 9 (colour illus. ), 28. 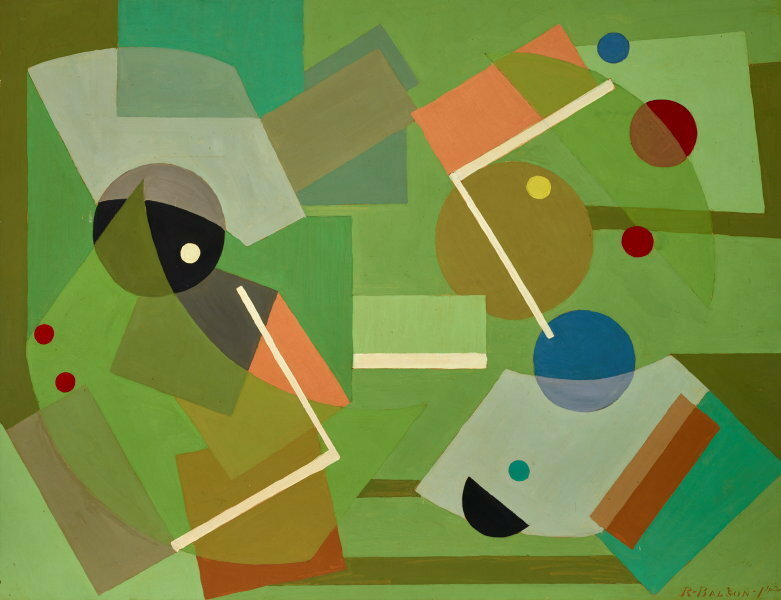 Elena Taylor, Symposium papers: Colour in art - revisiting 1919 & R-Balson , 'Crowley-Balson: Collaboration in abstraction', pg. 37-39, Sydney, 2008, 37, 38. Daniel Thomas, Gallery A Sydney 1964 - 1983 , 'Ralph Balson and Gallery A', pg. 103-115, Campbelltown, 2009, 105 (colour illus. ), 110, 112. Natalie Wilson, Parallel visions: works from the Australian collection , 'Grace Crowley / Ralph Balson / Frank Hinder / Margel Hinder', pg. 88-103, Sydney, 2002, 94, 95 (colour illus. ), 142, 147.